The crew from Warfield Academy travel on a field trip to the Egyptian ruins to witness Professor Giza open the recently discovered tomb of Pharaoh Hiphurrah. It is to their horror they they discovered the tomb has been invaded! The raiders flee leaving behind only one clue: a black scarab pendant. 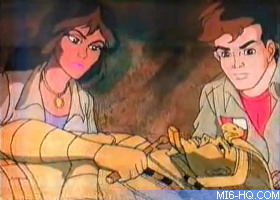 After examining the pendant, Junior notices that it bares the symbol of Pharaoh Fearo: a Egyptian tomb raider with ties to S.C.U.M.! Inside the scarab is a map of the local area and what seems to be a proposed network of pipelines. When our heroes return to the tomb they discover that the mummy of Hiphurrah has vanished. The only witness, a horrified security guard who, he says, saw the mummy walk! In his panic, Trevor Noseworthy accidentally sets off an earthquake using IQ's sonic shovel, burrying them all in the tomb. Bond and Egyptian teenager Cleo Dawe translate the heiroglyphs and use the readings to discover a hidden passageway leading to where Hiphurrah's treasure is located. But upon finding it the two are kidnapped by Fearo. 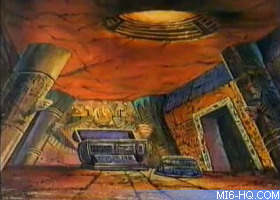 It turns out Fearo is using a subterranean module of which bores a giant diamond, he plans to drill a series of tunnels of which will drain all of the oil from the Middle East for S.C.U.M. to ransom. 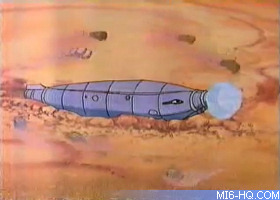 Bond and Cleo escape using Fearo's own drilling machine as a getaway vehicle and sabotage the drilling so the Subterranean fills with oil, forcing it to the surface. After making it back to the outside world, Bond and Cleo team up with some oil sheiks to stop Fearo before he can resume drilling and uses it to free their friends (and Trevor) from the tomb. 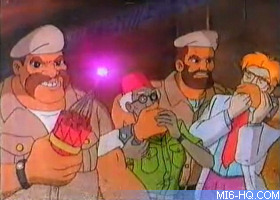 It turns out that the walking mummy was really Fearo's cousin Viper, trying to scare off everyone. The Subterranean is the world's first underground war ship. 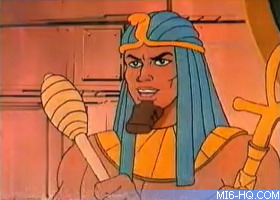 When Jr meets Pharoah Fearo, he introduces himself as "Bond. James Bond" without mentioning "Jr."
This story was renamed 'Sandblast' for the novelisation. For a sealed tomb that 'hasn't been opened since the 18th dynasty,' it has two handy skylights, one of which Bond uses to dispose of some unwanted dynamite, and another that would have provided fresh air despite Hiphurrah's concern about them running out of oxygen when trapped. If S.C.U.M. were so in need of funds, why not sell the diamond the size of a house that's used on Fearo's digger, or the tomb full of gold they walk through to hide the drill site? Despite being made of metal, the Subterranean moves, twists, and swells like a worm. Apparently, dotted lines on any map are immediately recognisable as proposed pipelines. Cleo Dawe knows what a 'sand torpedo' is and can spot one at a distance. James Bond Jr: I happen to know a great little cafe in Cairo. James Bond Jr: I find your methods rather 'crude'. James Bond Jr: You know what they say, oil and water don't mix. 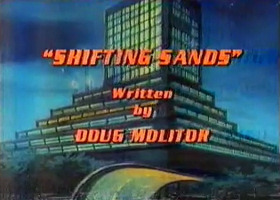 James Bond Jr: [The mummy] is too wrapped up in his work.